Is It Safe (or even Sane) to Travel to Beirut? Since my May 2015 post on safety in Beirut is my most popular ever, I wanted to post an update on the situation. Some of you are reading because you know me personally, and like to stay in touch and worry about me and my family living here. And some of you are reading because you’re planning a trip to Beirut – for work, or to visit your spouse’s family for the holidays. (And maybe someone somewhere is planning a trip for pure tourism, but I have to admit, that seems highly unlikely.) You may have seen the U.S. State Department’s most recent travel warning, issued December 11th, and are wondering if you are in your right mind to come visit. On the other hand, if I were living in the U.S., a guy with a gun could walk into my movie theater or my kids’ school and start randomly shooting at any time. There have been hundreds of mass shootings in the U.S. in the past year,* and one bombing in Lebanon in the same time frame. If I were living in Paris, I would have risked getting caught in the horrifying massacre that took place two days after Beirut’s tragedy. All terrible things, but not a reason to run away from Beirut or Paris or Aurora or Newtown. I don’t embrace danger, but I also refuse to be paralyzed by fear. Life holds no guarantees, but we can confront our fears rather than let them rule us. The Lebanese do an amazing job of demonstrating that principle, and in this regard, I hope to keep taking my cues from them. My mother-in-law sent worried messages to my husband when the U.S. travel warning made the news in Italy. He sent back pictures of us having dessert on the terrace of the newly-opened Cheescake Factory here in Beirut. I’ll leave you instead with a few more images of Beirut decked out for the holiday season. The Christmas tree and Nativity in the Emirati-owned City Centre shopping mall in the Beirut neighborhood of Hazmieh. Opposite the Cheesecake Factory in Verdun, a predominantly Muslim neighborhood. This year’s Christmas tree in Martyr’s Square, downtown Beirut. Creative lighting at a posh clothing store in downtown Beirut. I love it! *Mass shootings are defined as those in which 4 or more people have been shot (either wounded or killed). ShootingTracker lists 353 mass shootings in the U.s. in 2015 as of December 2nd, and Gun Violence Archive has recorded another 8 since then. 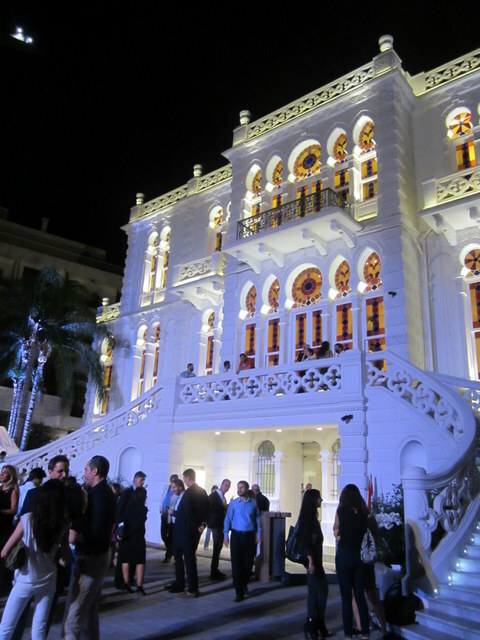 After nine long years, Beirut’s Sursock Museum reopened this weekend. The museum houses modern and contemporary art in a setting as elegant as the artwork within: an Italianate villa located in a well-heeled district of Beirut. First opened in 1961, the Sursock was long the reference point for contemporary art in Lebanon, hosting an annual salon, or exhibition of emerging artists, as well as a permanent collection of renowned painters from the region. The museum managed to stay open through most of Lebanon’s 15-year civil war, but closed in 2008 to undergo seven long years of renovation. Emblematic of the resilience of the Lebanese themselves, the museum reopened this weekend, amidst a garbage crisis, a political crisis, and a refugee crisis of historical proportions. Fittingly, the museum’s director, Zeina Arida, has curated opening exhibitions that share a theme of identity. 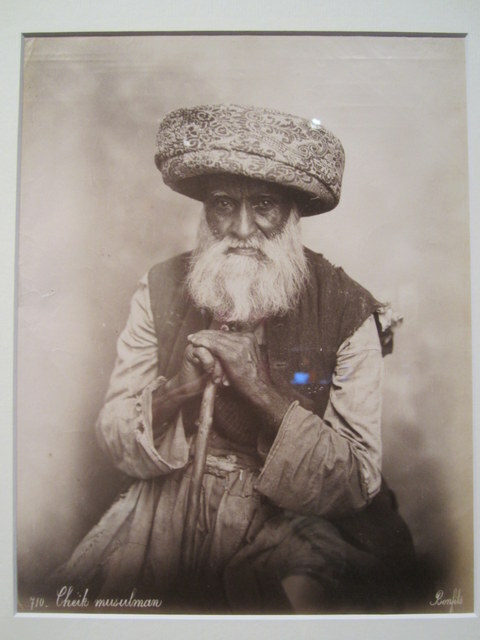 In “Picturing Identity” photographs summon the past of the Lebanese people. 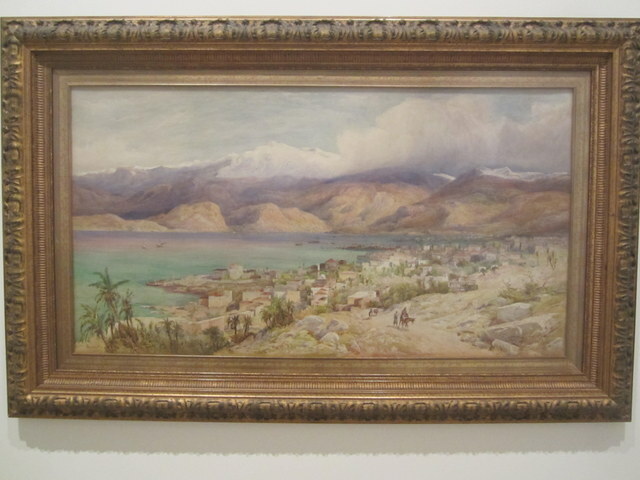 In “Regards sur Beyrouth” paintings evoke the history of the local landscape. Foreign influences, environmental degradation, profiteering…. Lebanon’s present has disturbing echoes of its past, and serves as a reminder that only by studying history can we grasp how things might change or remain the same. All of which circles me back to the reopening of the Sursock Museum, its exhibitions and public programming. Yes, the garbage crisis remains unresolved, with hills of refuse blighting Lebanon’s landscape and clogging its riverbeds. It’s true, Lebanon’s longstanding political crisis (including a 15-month-and-counting presidential vacuum) has deepened the garbage crisis. And while the number of officially registered Syrian refugees in Lebanon has dropped in recent months, there remain more than one million, for a staggering statistic of 1 in 5 people in Lebanon is a Syrian refugee. Much of the system in Lebanon seems to be held together with aging Scotch tape, threatening to peel off at any moment. Yet the Sursock Museum, Zeina Arida, Nora Razian, Lina Mounzer, and all the others involved with the Sursock’s reopening and public programs, are the embodiment of resilience. They remind us to step back to see more clearly who we are and where we came from, so that we can better see where we want to go next. Culture is not a luxury. Culture is part of us. It’s what constitutes a person, it links generations and gives meaning to history. Knowing one’s culture is knowing one’s self. Identifying and preserving one’s heritage allows reaching out to the others.